Improved design to stop oil leakage. Fits 1936 -1954 OHV Big Twins. 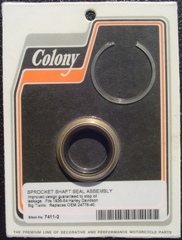 An improvement when installed in any overhaul, a must when installing a primary belt drive.